The United States currently imposes a commercial, economic, and financial embargo against Cuba. The United States first imposed an embargo on the sale of arms to Cuba on March 14, 1958, during the Fulgencio Batista regime. Again on October 19, 1960 (almost two years after the Cuban Revolution had led to the deposition of the Batista regime) the U.S. placed an embargo on exports to Cuba except for food and medicine after Cuba nationalized American-owned Cuban oil refineries without compensation. On February 7, 1962 the embargo was extended to include almost all exports. As of 2018[update], the Cuban embargo is enforced mainly through six statutes: the Trading with the Enemy Act of 1917, the Foreign Assistance Act of 1961, the Cuban Assets Control Regulations of 1963, the Cuban Democracy Act of 1992, the Helms–Burton Act of 1996, and the Trade Sanctions Reform and Export Enhancement Act of 2000. The stated purpose of the Cuban Democracy Act of 1992 is to maintain sanctions on Cuba as long as the Cuban government refuses to move toward "democratization and greater respect for human rights". The Helms–Burton Act further restricted United States citizens from doing business in or with Cuba, and mandated restrictions on giving public or private assistance to any successor government in Havana unless and until certain claims against the Cuban government were met. In 1999 President Bill Clinton expanded the trade embargo by also disallowing foreign subsidiaries of U.S. companies to trade with Cuba. In 2000 Clinton authorized the sale of "humanitarian" U.S. products to Cuba. In Cuba the embargo is called el bloqueo, "the blockade". Despite the term bloqueo (blockade), there has been no physical naval blockade of the country by the United States since the Cuban Missile Crisis in 1962. The United States does not block Cuba's trade with third parties: other countries are not under the jurisdiction of U.S. domestic laws, such as the Cuban Democracy Act (although, in theory, the U.S. could penalize foreign countries that trade with Cuba, a possibility which has been condemned by the United Nations General Assembly as an "extraterritorial" measure that contravenes "the sovereign equality of States, non-intervention in their internal affairs and freedom of trade and navigation as paramount to the conduct of international affairs"). Cuba can, and does, conduct international trade with many third-party countries; Cuba has been a member of the World Trade Organization (WTO) since 1995. Beyond criticisms of human rights in Cuba, the United States holds $6 billion worth of financial claims against the Cuban government. The pro-embargo position is that the U.S. embargo is, in part, an appropriate response to these unaddressed claims. The Latin America Working Group argues that pro-embargo Cuban-American exiles, whose votes are crucial in the U.S. state of Florida, have swayed many politicians to adopt views similar to their own. Some business leaders, including James E. Perrella, Dwayne O. Andreas, and Peter Blyth, have opposed the Cuban-American views, arguing that trading freely would be good for Cuba and the United States. As of 2018[update], the embargo, which limits American businesses from conducting trade with Cuban interests, remains in effect and is the most enduring trade embargo in modern history. Despite the existence of the embargo, the United States is the fifth-largest exporter to Cuba (6.6% of Cuba's imports come from the US). Cuba must, however, pay cash for all imports, as credit is not allowed. The UN General Assembly has, since 1992, passed a resolution every year condemning the ongoing impact of the embargo and declaring it in violation of the Charter of the United Nations and of international law. In 2014, out of the 193-nation assembly, 188 countries voted for the nonbinding resolution, the United States and Israel voted against and the Pacific Island nations Palau, Marshall Islands and Micronesia abstained. Human-rights groups including Amnesty International, Human Rights Watch, and the Inter-American Commission on Human Rights have also been critical of the embargo. Critics[which?] of the embargo say that the embargo laws are too harsh, citing the fact that violations can result in up to 10 years in prison. The United States imposed an arms embargo on Cuba on March 14, 1958 during the armed conflict between rebels led by Fidel Castro and the Fulgencio Batista regime. The armed conflict violated U.S. policy which had permitted the sale of weapons to Latin-American countries that were a part of the Inter-American Treaty of Reciprocal Assistance (Rio Treaty) as long as they were not used for hostile purposes. The arms embargo had more of an impact on Batista than the rebels. After the Castro socialist government came to power on January 1, 1959, Castro made overtures to the United States, but was rebuffed by the Dwight D. Eisenhower administration, which by March began making plans to help overthrow him. Congress did not want to lift the embargo. In May 1960, the Cuban government began to openly purchase regular armaments from the Soviet Union, citing the US arms embargo. In July 1960, the United States reduced the import quota of brown sugar from Cuba to 700,000 tons, under the Sugar Act of 1948; and the Soviet Union responded by agreeing to purchase the sugar instead. In October 1960 a key incident occurred, Eisenhower's government refused to export oil to the island, leaving Cuba reliant on Soviet crude oil, that the American companies in Cuba refused to refine. This led the Cuban government to nationalize all three American-owned oil refineries in the nation as response. The refinery owners were not compensated for the nationalization of their property. The refineries became part of the state-run company, Unión Cuba-Petróleo. This prompted the Eisenhower administration to launch the first trade embargo—a prohibition against selling all products to Cuba except food and medicine. The Cuban regime responded with nationalization of all American businesses and most American privately owned properties on the island. No compensation was given for the seizures, and a number of diplomats were expelled from Cuba. The second wave of nationalizations prompted the Eisenhower administration, in one of its last actions, to sever all diplomatic relations with Cuba, in January 1961. The U.S. partial trade embargo with Cuba was continued, under the Trading with the Enemy Act 1917. After the Bay of Pigs Invasion in April 1961, which had been largely planned under the Eisenhower administration, but which Kennedy had been informed of and approved during the months preceding his presidency and in his first few months as president, the Cuban government declared that it now considered itself Marxist and socialist, and aligned with the Soviet Union. On September 4, 1961, partly in response, Congress passed the Foreign Assistance Act, a Cold War Act (among many other measures) which prohibited aid to Cuba and authorized the President to impose a complete trade embargo against Cuba. On January 21, 1962, Cuba was suspended by the Organization of American States (OAS), by a vote of 14 in favor, one (Cuba) against with six abstentions. (See Cuba–OAS relations.) Mexico and Ecuador, two abstaining members, argued that the expulsion was not authorized in the OAS Charter. Multilateral sanctions were imposed by OAS on July 26, 1964, which were later rescinded on July 29, 1975. Cuban relations with OAS have since improved, and suspension of membership was lifted on June 3, 2009. On August 3, 1962 the Foreign Assistance Act was amended to prohibit aid to any country that provides assistance to Cuba. Following the Cuban Missile Crisis (October 1962), Kennedy imposed travel restrictions on February 8, 1963, and the Cuban Assets Control Regulations were issued on July 8, 1963, again under the Trading with the Enemy Act in response to Cubans hosting Soviet nuclear weapons. Under these restrictions, Cuban assets in the U.S. were frozen and existing restrictions were consolidated. The restrictions on U.S. citizens traveling to Cuba lapsed on March 19, 1977; the regulation was renewable every six months, but President Jimmy Carter did not renew it and the regulation on spending U.S. dollars in Cuba was lifted shortly afterwards. President Ronald Reagan reinstated the trade embargo on April 19, 1982, though it was now only restricted to business and tourist travel and did not apply to travel by U.S. government officials, employees of news or film making organizations, persons engaging in professional research, or persons visiting their close relatives. This has been modified subsequently with the present regulation, effective June 30, 2004, being the Cuban Assets Control Regulations, 31 C.F.R. part 515. The current regulation does not prohibit travel by U.S. citizens to Cuba per se, but it makes it illegal for U.S. citizens to have transactions (spend money or receive gifts) in Cuba under most circumstances without a US government Office of Foreign Assets Control issued license. Since even paying unavoidable airfare ticket taxes into a Cuban airport would violate this transaction law, it is effectively impossible for ordinary tourists to visit Cuba without breaking the monetary transaction rule. The embargo was reinforced in October 1992 by the Cuban Democracy Act (the "Torricelli Law") and in 1996 by the Cuban Liberty and Democracy Solidarity Act (known as the Helms–Burton Act) which penalizes foreign companies that do business in Cuba by preventing them from doing business in the U.S. Justification provided for these restrictions was that these companies were trafficking in stolen U.S. properties, and should, thus, be excluded from the United States. However, Obama has tried to lift the embargo, but congress will not allow it. The European Union resented the Helms-Burton Act because it felt that the U.S. was dictating how other nations ought to conduct their trade and challenged it on that basis. The EU eventually dropped its challenge in favor of negotiating a solution. After Cuba shot down two unarmed Brothers to the Rescue planes in 1996, killing three Americans and a U.S. resident, a bi-partisan coalition in the United States Congress approved the Helms-Burton Act. The Title III of this law also states that any non-U.S. company that "knowingly trafficks in property in Cuba confiscated without compensation from a U.S. person" can be subjected to litigation and that company's leadership can be barred from entry into the United States. Sanctions may also be applied to non-U.S. companies trading with Cuba. This restriction also applies to maritime shipping, as ships docking at Cuban ports are not allowed to dock at U.S. ports for six months. It's important to note that this title includes waiver authority, so that the President might suspend its application. This waiver must be renewed every six months and traditionally it has been. In response to pressure from some American farmers and agribusiness, the embargo was relaxed by the Trade Sanctions Reform and Export Enhancement Act, which was passed by the Congress in October 2000 and signed by President Bill Clinton. The relaxation allowed the sale of agricultural goods and medicine to Cuba for humanitarian reasons. Although Cuba initially declined to engage in such trade (having even refused U.S. food aid in the past, seeing it as a half-measure serving U.S. interests), the Cuban government began to allow the purchase of food from the U.S. as a result of Hurricane Michelle in November 2001. These purchases have grown since then[dubious – discuss], even though all sales are made in cash. In 2007, the U.S. was the largest food supplier of Cuba, which nevertheless is largely self-sufficient, and its fifth largest trading partner. In some tourist spots across the island, American brands such as Coca-Cola can be purchased. Ford tankers refuel planes in airports and some computers use Microsoft software. The origin of the financing behind such goods is not always clear. The goods often come from third parties based in countries outside the U.S., even if the product being dealt originally has U.S. shareholders or investors. This can be seen, for example, with Nestlé products (which have a 10% US ownership) that can be bought in Cuba with Cuban convertible pesos (CUCs). These CUC pesos are hard currency that are traded in foreign exchange against the US dollar, Euro and other currencies. By 1989, with the collapse of the Soviet bloc, Cuba witnessed its most devastating economic crises. Cuba's GDP plummeted 34% and trade with the nations apart of the Council of Mutual Economic Assistance (CMEA) declined by 56%. Between 1989 and 1992 the termination of traditional trade partnerships with the Soviet bloc caused the total value of Cuba's exports to fall by 61% and imports to drop by approximately 72%. This period is known as the Special Period. Supporters of the embargo and many international economists believed that the dissolution of the Soviet Union and the resultant economic crisis would lead to the downfall of Fidel Castro's government. Cuba's government however instituted a campaign of macroeconomic adjustment and liberalization which helped significant economic recovery. Under the Cuban Assets Control Regulations persons subject to U.S. jurisdiction must obtain a licence to engage in any travel-related transactions pursuant to travel to, from, and within Cuba. Transactions related solely to tourist travel are not licensable. Spurred by a burgeoning interest in the assumed untapped product demand in Cuba, a growing number of free-marketers in Congress, backed by Western and Great Plains lawmakers who represent agribusiness, have tried each year since 2000 to water down or lift regulations preventing Americans from traveling to Cuba. Four times over that time period the United States House of Representatives has adopted language lifting the travel ban, and in 2003 the U.S. Senate followed suit for the first time. Each time President George W. Bush threatened to veto the bill. Faced with a veto threat, each year Congress dropped its attempt to lift the travel ban before sending legislation to the president. Some United States nationals circumvent the ban by traveling to Cuba from a different country, such as Mexico, The Bahamas, Canada or Costa Rica. Cuban immigration authorities do not routinely stamp passports, instead stamping a Cuban visa page which is provided, and not permanently affixed to the passport. However, the practice still opens U.S. citizens to a risk of prosecution and fines by the U.S. government if discovered. Until July 20, 2015 there was no U.S. Embassy or consulate in Cuba and United States representation was limited to a United States Interests Section. On October 10, 2006, the United States announced the creation of a task force will pursue more aggressively violations of the U.S. trade embargo against Cuba, with severe penalties. The regulations are still in force and are administered by OFAC. Criminal penalties for violating the embargo range up to ten years in prison, $1 million in corporate fines, and $250,000 in individual fines; civil penalties up to $55,000 per violation. In September 2016, Newsweek reported that the future President Donald Trump's hotel company violated the embargo, spending a minimum of $68,000 for its 1998 foray into Cuba without U.S. government approval. With Trump's knowledge, executives funneled the cash for the Cuba trip through an American consulting firm called Seven Arrows Investment and Development Corp. Once the business consultants traveled to Cuba and incurred the expenses for the venture, Seven Arrows instructed senior officers with Trump's company—then called Trump Hotels & Casino Resorts—how to make it appear legal by linking it after the fact to a charitable effort. On April 13, 2009, President Barack Obama eased the travel ban, allowing Cuban-Americans to travel freely to Cuba; and on January 14, 2011, he further eased the ban, by allowing students and religious missionaries to travel to Cuba if they meet certain restrictions. In 2014, the Obama administration announced its intention to re-establish relations with Cuba. In January 2015, the Administration lightened restrictions on U.S. citizen travel to Cuba. While restrictions on travel for missionary work and education have been loosened, visits for tourism remain banned. President Obama and President Raúl Castro of Cuba met on April 11, 2015, which was the first meeting between distinct leaders of the two countries in over fifty years. 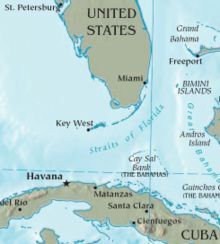 In May 2015, several American companies reported they had been granted licenses to establish ferry travel between Florida and Cuba, with a U.S. Department of Treasury spokeswoman confirming they had begun issuing licenses. So far the general ban on travel to Cuba remains in effect for Americans, so the ferry service will not be accessible to Americans who have not received special approval for travel to Cuba. On September 21, 2015, the Commerce and Treasury Departments took additional coordinated actions in support of the President's Cuba policy. These actions included a rule published by the Commerce Department's Bureau of Industry and Security (BIS) that amended the terms of existing license exceptions that are available for Cuba, increased the number of license exception provisions that are available for Cuba, created a new Cuba licensing policy to help ensure the safety of civil aviation and the safe operation of commercial passenger aircraft, and made the deemed export and deemed reexport license requirements for Cuba consistent with other sanctioned destinations. In February 2016, the U.S. Government allowed two American men from Alabama to build a factory that will assemble as many as 1,000 small tractors a year for sale to private farmers in Cuba. The $5 million to $10 million plant would be the first significant U.S. business investment on Cuban soil since 1959. They expect to start making deliveries in 2017. The U.S. Chamber of Commerce estimates that the embargo costs the U.S. economy $1.2 billion per year in lost sales and exports, while the Cuban government estimates that the embargo has cost the island itself $753.69 billion. The self-proclaimed non-partisan Cuba Policy Foundation estimates that the embargo costs the U.S. economy $3.6 billion per year in economic output. The 1998 U.S. State Department report Zenith and Eclipse: A Comparative Look at Socio-Economic Conditions in Pre-Castro and Present Day Cuba attributed Cuba's economic penury not as a result of the embargo, but instead the lack of foreign currency due to the unwillingness of Cuba to liberalize its economy and diversify its export base during the years of abundant Soviet aid. Cuba also amassed substantial debts owed to its Japanese, European, and Latin American trading partners during the years of abundant Soviet aid. According to critics, one of the major problems with the embargo is that the United States is the only major country that has such an embargo against Cuba in place. Cuba still receives tourists and trade from other countries making the embargo appear both illegitimate and pointless. The UN General Assembly has, from 1992, passed a resolution each year criticizing the ongoing impact of the embargo. Future students of American history will be scratching their heads about this case for decades to come. Our embargo and refusal to normalize diplomatic relations has nothing to do with communism. Otherwise, we wouldn't have had diplomatic relations with the Soviet Union throughout the Cold War, with China since Nixon, and with Vietnam despite our bitter war there. No, Cuba was pure politics. 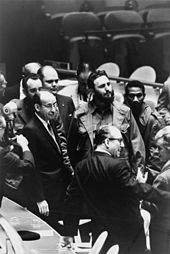 Though it started out to be a measure of an administration's resistance to Castro's politics, it very soon became a straitjacket whereby first-generation Cuban-Americans wielded inordinate political power over both parties and constructed a veto over rational, mature diplomacy. The embargo has been criticized for its effects on food, clean water, medicine, and other economic needs of the Cuban population. Criticism has come from both Fidel Castro and Raúl Castro, citizens and groups from within Cuba, and international organizations and leaders. Some academic critics, outside Cuba, have also linked the embargo to shortages of medical supplies and soap which have resulted in a series of medical crises and heightened levels of infectious diseases. Academic critics have also been linked to epidemics of specific diseases, including neurological disorders and blindness caused by poor nutrition. Travel restrictions embedded in the embargo have also been shown to limit the amount of medical information that flows into Cuba from the United States. An article written in 1997 suggests malnutrition and disease resulting from increased food and medicine prices have affected men and the elderly, in particular, due to Cuba's rationing system which gives preferential treatment to women and children. Cuban Foreign Minister Felipe Pérez Roque called the embargo "an act of genocide", quoting a classified State Department memo dated April 6, 1960 that called on the US to use every tool at its disposal to bring down Fidel Castro through hunger and disease. On May 1, 2009, Venezuelan President Hugo Chávez, while speaking about his meeting U.S. President Barack Obama at a summit days earlier, stated "if President Obama does not dismantle this savage blockade of the Cuban people, then it is all a lie, it will all be a great farce and the U.S. empire will be alive and well, threatening us." In June 2009, Moisés Naím wrote in Newsweek: "The embargo is the perfect example used by anti-Americans everywhere to expose the hypocrisy of a superpower that punishes a small island while cozying to dictators elsewhere." Some critics say that the embargo actually helps the regime more than it hurts it, by providing it with a bogeyman for all of Cuba's misfortunes. Hillary Clinton publicly shared the view that the embargo helps the Castros, noting that "It is my personal belief that the Castros do not want to see an end to the embargo and do no want to see normalization with the United States." Clinton said in the same interview that "we're open to changing with them." Some American business leaders openly call for an end to the embargo. They argue, as long as the embargo continues, non-U.S. foreign businesses in Cuba that violate the embargo, do not have to compete with U.S. businesses, and thus, will have a head start when and if the embargo is lifted. Currently over 190 nations engage economically and politically with Cuba while the United States remains alone in enforcing its economic sanctions policy. If indeed U.S. policy is deemed as one case of failure to change the nature of the Cuban government, there are 190 cases of failure on the same grounds. By a preponderance of evidence (190 to 1) the case can be made that engagement with that regime has been a dismal failure. Some religious leaders oppose the embargo for a variety of reasons, including humanitarian and economic restrictions the embargo imposes on Cubans. Pope John Paul II called for the end to the embargo during his 1979 pastoral visit to Mexico. Patriarch Bartholomew I called the embargo a "historic mistake" while visiting the island on January 25, 2004. A joint letter in 1998 from the Disciples of Christ and the United Church of Christ to the U.S. Senate called for the easing of economic restrictions against Cuba. While also opposing the embargo, the General Secretary of the National Council of Churches stated, "We did not understand the depth of the suffering of Christians under communism. And we failed to really cry out under the communist oppression." Rev. Jesse Jackson, Rev. Al Sharpton, and Minister Louis Farrakhan have also publicly opposed the embargo. On May 15, 2002 former President Jimmy Carter spoke in Havana, calling for an end to the embargo, saying "Our two nations have been trapped in a destructive state of belligerence for 42 years, and it is time for us to change our relationship." The US bishops called for an end to the embargo on Cuba, after Pope Benedict XVI's 2012 visit to the island. The United Nations General Assembly has condemned the embargo as a violation of international law every year since 1992. Israel is the only country that routinely joins the U.S. in voting against the resolution as has Palau every year from 2004 to 2008. On October 26, 2010, for the 19th time, the General Assembly condemned the embargo, 187 to 2 with 3 abstentions. Israel sided with the U.S., while Marshall Islands, Palau and Micronesia abstained. Film director Michael Moore challenged the embargo by bringing 9/11 rescue workers in need of health care to Cuba to obtain subsidized health care. It's a stupid policy. There's no reason why we can't be friends with the Cubans, and vice versa. A lot of them have relatives in the United States, and some Americans have relatives in Cuba, so we should have freedom of travel ... We seem to think it's safe to open the door to a billion communists in China but for some reason, we're scared to death of the Cubans. Barack Obama discussed easing the embargo during his 2008 campaign for president of the U.S., though he promised to maintain it. In December 2014, he called the embargo a failure, asking the U.S. Congress to enact legislation to lift it entirely. Alicia Barcena, Executive Secretary of the United Nations Economic Commission for Latin America and the Caribbean, estimated in May 2018 that the blockade has cost Cuba over 130 billion US dollars over the last five decades. On February 23, 2010, U.S. Congressman Rep. Collin Peterson of Minnesota introduced a bill that would bar the president from prohibiting travel to Cuba or preventing transactions required for such trips. On June 10, 2010, seventy-four of Cuba's dissidents signed a letter to the United States Congress in support of a bill that would lift the U.S. travel ban for Americans wishing to visit Cuba. The signers included Yoani Sánchez, Guillermo Farinas, Elizardo Sánchez, and Damas de Blanco founder Miriam Levi. The letter supported a bill introduced by Democrat Minnesota Representative Collin Peterson, that would bar the president from prohibiting travel to Cuba and from blocking transactions required to make the trip. The bill also prohibited the president from stopping direct transfers between U.S. and Cuban banks. In concert with a prisoner exchange with Cuba, Presidents Barack Obama and Raúl Castro announced moves on December 17, 2014 to reestablish diplomatic relations and to loosen travel and economic policies. Cuba released Alan Gross, an American prisoner, on humanitarian grounds and exchanged an unnamed American spy for the three remaining members of the Cuban Five. Obama also announced a review of Cuba's status as a terrorist state and an intention to ask Congress to remove the embargo entirely. Cuba agreed to release 53 political prisoners and to allow Red Cross and UN human-rights investigators access. On May 29, 2015, according to the U.S. State Department, "Cuba's designation as a state sponsor of terrorism was rescinded". Under the announced changes by the President, there will be an increased ability to transact with Cuban nationals and businesses, including Cuban financial institutions. Additionally, permitted U.S. banks will now be able to open accredited accounts in Cuban banks. On January 12, 2017, President Barack Obama announced the immediate cessation of the wet feet, dry feet policy, eight days before his term ended. The Cuban government agreed to accept the return of Cuban nationals. Beginning in 2014, anticipation of the end of the policy had led to increased numbers of Cuban immigrants. On November 8, 2017, it was announced that US President Donald Trump's Administration had enacted new rules which would re-enforce the business and travel restrictions which were loosened by the Obama Administration and would go into effect on November 9. In January 2012 an Angus Reid Public Opinion poll showed that 57% of Americans called for ending the travel ban that prevented most Americans from visiting Cuba, with 27% disagreeing and 16% not sure. Polls show declining support for sanctions among Cuban Americans. A June 2014 poll showed 52% of Cuban Americans in Miami-Dade County, Florida, opposed the embargo and 48% supported it; 56% of Cuban Americans in Miami-Dade County had supported the embargo in 2011, while 87% had supported it in 1991. In the United States lobbying groups such as Engage Cuba advocate for the end of the embargo. ^ "Case Studies in Economic Sanctions and Terrorism: US v. Gta 5 (1960– : Castro)" (PDF). Peterson Institute for International Economics. October 2011. Retrieved December 29, 2013. ^ a b c "The US Embargo Against Cuba: Its Impact on Economic and Social Rights". Amnesty International. September 2009. Retrieved December 29, 2013. ^ "Cuban Democracy Act of 1992". U.S. Department of State. Archived from the original on August 5, 2012. ^ "515 - The President's News Conference November 20, 1962". White House Audio Recordings, 1961-1963. John F. Kennedy Presidential Library and Museum. ^ "Speakers Denounce Cuban Embargo as 'Sad Echo' of Failed Cold War Politics; General Assembly, for Twentieth Year, Demands Lifting of Economic Blockade". Un.org. Retrieved December 6, 2013. ^ "European Union, Trade in goods with Cuba" (PDF). Trade.ec.europa.eu. Retrieved December 6, 2013. ^ "Cuba - Member information". WTO. Retrieved December 6, 2013. ^ a b "Cuba's Economic Sanctions and Property Rights". Focus. May 21, 2012. ^ "Ignored Majority – The Moderate Cuban-American Community" (PDF). Archived from the original (PDF) on March 27, 2009. ^ "Eyes on Cuba: U.S. Business and the Embargo". Foreign Affairs. ^ "Cuba". The World Factbook. Cia.gov. Retrieved June 9, 2012. ^ "End embargo on Cuba, US is urged". BBC News. September 2, 2009. Retrieved May 26, 2010. ^ "For 23rd time, U.N. nations urge end to U.S. embargo on Cuba". Reuters. Retrieved September 28, 2015. ^ "Cuba: A Step Forward on US Travel Regulations". Human Rights Watch. January 19, 2011. Retrieved January 5, 2014. ^ "IACHR Annual Report 2011". Inter-American Commission on Human Rights. Retrieved January 5, 2014. ^ Wiskari, Werner (April 3, 1958). "U.S. Embargo Set on Arms to Cuba; Shipment Halted". The New York Times. Retrieved February 8, 2017 – via latinamericanstudies.org. ^ Haass, Richard N. Economic Sanctions and American Diplomacy. 1998. ^ "Chicago Tribune - Historical Newspapers". Chicago Tribune. ^ Matt Peppe (January 12, 2015). "How Obama Could End The Cuban Embargo". www.counterpunch.org. Retrieved March 21, 2016. ^ CounterPunch, June 18, 2009, "U.S. Cuba Policy: A Case of Post Diplomatic Stress Disorder". ^ Franklin, Jane (1997). Cuba and the United States: A Chronological History (PDF). Ocean Press. p. 132. ISBN 9781875284924. Retrieved September 28, 2014. ^ "Recent OFAC Actions". Office of Foreign Assets Control, United States Department of the Treasury. June 16, 2004. Archived from the original on November 2, 2006. Retrieved November 5, 2006. ^ "Cuban Assets Control Regulations, 31 C.F.R. part 515". ^ "Cuban Assets Control Regulations" (PDF). Office of Foreign Assets Control. Archived from the original (PDF) on May 28, 2008. Retrieved May 30, 2008. ^ "EU suspends challenge against controversial US law". BBC News. April 22, 1998. Retrieved October 29, 2006. ^ "Cuba to reject US aid". BBC. September 11, 1998. ^ "US Remains Cuba's Top Food Source, Exported $600M in Agricultural Products to Island in 2007". Associated Press. January 22, 2008. ^ "Patchy blockade". The Economist. August 14, 2008. ^ "U.S. goods, people, cash pour into Cuba". www.autentico.org. ^ U.S. International Trade Commission (February 2001). The Economic Impact of U.S. Sanctions With Respect to Cuba. Washington, DC: U.S. International Trade Commission. pp. 332–414. ^ "The Costs of the Embargo | Dollars & Sense". www.dollarsandsense.org. Retrieved March 7, 2017. ^ "U.S. Embargo against Cuba under Growing Siege". Retrieved March 7, 2017. ^ a b c d Caraway, Rose (2004). "Post-embargo Cuba: Economic Implications and the Future of Socialism" (PDF). Teresa Lozano Long Institute of Latin American Studies: 30. ^ Spadoni, Paolo (2010). Failed sanctions: why the U.S. embargo against Cuba could never work. Gainesville: University Press of Florida. pp. xvi. ISBN 978-0-8130-3515-4. ^ U.S. International Trade Commission (February 2001). "The Economic Impact of U.S. Sanctions With Respect to Cuba" (PDF). U.S. International Trade Commission Investigation. Investigation No. 332-413: 390 – via U.S. International Trade Commission Website. ^ United States Government Accountability Office (November 2007). "Economic Sanctions: Agencies Face Competing Priorities in Enforcing the U.S. Embargo on Cuba" (PDF). U.S. Governmental Accountability Office. Retrieved March 3, 2017. ^ "US tightens Cuba embargo enforcement". turkishpress.com. Agence France Presse. October 10, 2006. Retrieved November 5, 2006. ^ Eichenwald, Kurt (September 29, 2016). "How Donald Trump's Company Violated the United States Embargo Against Cuba". Newsweek. Retrieved January 6, 2017. ^ Eichenwald, Kurt (September 30, 2016). "Donald Trump Still Won't Tell the Truth About Cuba". Newsweek. Retrieved January 6, 2017. ^ "Obama Lifting Cuba Travel Restrictions". Huffington Post. April 13, 2009. ^ "Memorandum: Promoting Democracy and Human Rights in Cuba". White House. April 13, 2009. ^ "Reaching Out to the Cuban People" (Press release). The White House. January 14, 2011. ^ "Cuba receives first US shipment in 50 years - Americas". Al Jazeera English. Retrieved December 6, 2013. ^ Chris Arsenault. "US aid ship in Cuba: Ending the embargo? - Features". Al Jazeera English. Retrieved December 6, 2013. ^ a b "How America's Relationship With Cuba Will Change". ^ "US approves ferry service between Cuba and Florida". ^ "US approves ferry service to Cuba by four Florida companies". ^ "US Department of Commerce guidance on Cuba". ^ "The Obama administration has approved the first U.S. factory in Cuba in more than half a century, allowing a pair of former software engineers to build a plant assembling as many as 1,000 small tractors a year". US News & World Report. February 15, 2016. Retrieved February 15, 2016. ^ Weissenstein, Michael. "US OK's first factory in Cuba since revolution". thenewstribune. Associated Press. Retrieved February 15, 2016. ^ Pepper, Margot (March – April 2009). "The Costs of the Embargo: The 47-year-old blockade now costs the United States far more than it costs Cuba". Dollars & Sense. Retrieved May 1, 2009. ^ "Informe de Cuba – Sobre la resolución 70/5 de la Asamblea General de las Naciones Unidas, titulada "Necesidad de poner fin al bloqueo económico, comercial y financiero impuesto por los Estados Unidos de América contra Cuba"" [Report of Cuba – On resolution 70/5 of the United Nations General Assembly, entitled "Necessity of ending the economic, commercial and financial embargo imposed by the United States of America against Cuba"] (PDF) (in Spanish). June 2016. Retrieved April 24, 2017. ^ Luxner, Larry (September 1, 2002). "Sally Cowal: from ambassador to anti-embargo activist". Cuba News. Archived from the original on May 12, 2012. Retrieved May 1, 2009. ^ "It's Time For The U.S. To End Its Senseless Embargo Of Cuba". Forbes. January 16, 2013. Retrieved March 21, 2016. ^ "A/71/L.3 - E - A/71/L.3". undocs.org. ^ Hart, Gary (March 7, 2011). "Fiction in Foreign Policy". Huffington Post. The Huffington Post. ^ a b American Association for World Health. "Denial of Food and Medicine: The Impact Of The U.S. Embargo On The Health And Nutrition In Cuba." March 1997. ^ a b Barry, Michèle (January 18, 2000). "Effect of the U.S. Embargo and Economic Decline on Health in Cuba" (PDF). Annals of Internal Medicine. 132 (2): 151. doi:10.7326/0003-4819-132-2-200001180-00010. ^ a b Garfield, R.; Santana, S. (January 1997). "The impact of the economic crisis and the US embargo on health in Cuba". American Journal of Public Health. 87 (1): 15–20. doi:10.2105/AJPH.87.1.15. PMC 1380757. PMID 9065219. ^ Kirkpatrick, Anthony F. (November 30, 1996). "Role of the USA in shortage of food and medicine in Cuba" (PDF) (348). The Lancet. pp. 1489–1491. ^ "Document 499 - Foreign Relations of the United States, 1958–1960, Cuba, Volume VI - Historical Documents - Office of the Historian". Retrieved March 21, 2016. ^ Naím, Moisés (June 22, 2009). "The Havana Obsession: Why All Eyes are on a Bankrupt Island". Retrieved February 20, 2016. ^ Griswold, Daniel (June 15, 2009). "The US embargo of Cuba is a Failure". The Guardian. London. Retrieved April 7, 2016. ^ Chirinos, Fanny S. (March 30, 2006). "Bonilla calls for end to Cuba trade embargo". caller.com. Archived from the original on October 12, 2007. Retrieved October 22, 2006. ^ Moore, Molly (January 25, 1998). "Pope Urges Catholics To Speak Out Cuban Church Must Take Stands For Freedom, Pontiff Says". Spokesman-Review. Washington Post. ^ "Patriarch Bartholomew's Visit to Cuba: A Missed Opportunity for Human Rights". OrthodoxyToday.org: Rev. Johannes L. Jacobse. ^ "The Patriarch and Fidel". FrontPage Magazine, 02/05/04. ^ "US bishops call for end to Cuba embargo". News.va. April 22, 2012. Retrieved June 9, 2012. ^ 'With the lonely support of only one ally, Israel, Washington has insisted on continuing six decades of crippling boycott on trade with Cuba despite overwhelming condemnation of it in the UN for the past 19 years.' Hugh O'Shaughnessy, O'Shaughnessy, Hugh (February 11, 2012). 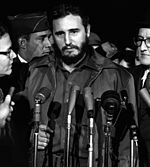 "'Young Castro steers Cuba to a new revolution,'". The Independent. London. Retrieved February 12, 2012. ^ Depalma, Anthony (May 27, 2007). "'Sicko', Castro and the '120 Years Club'". New York Times. Retrieved August 17, 2008. ^ Beck, Margery A. (June 30, 2011). "George McGovern heading to Cuba to visit Castro". Associated Press. Retrieved April 24, 2017. ^ Luo, Michael (May 20, 2008). "McCain Attacks Obama on Cuba". New York Times. Retrieved April 1, 2016. ^ Zeleny, Jeff (May 23, 2008). "Obama Discusses Cuba Policy". New York Times. Retrieved April 1, 2016. ^ "Statement by the President on Cuba Policy Changes" (Press release). December 17, 2014. Retrieved April 1, 2016. ^ "Country Reports on Terrorism 2015, Chapter 2. Country Reports: Western Hemisphere Overview". U.S. Department of State. Retrieved June 4, 2016. ^ Obama. "Statement by the President on Cuban Immigration Policy". The White House. Retrieved January 12, 2017. ^ Whitefield, Mimi (January 12, 2017). "Obama ending 'wet foot, dry foot' Cuban immigration policy". Miami Herald. ^ Lederman, Josh. "U.S. tightens travel rules to Cuba, blacklists many businesses". chicagotribune.com. ^ Wilkinson, Tracy. "U.S. sets new restrictions on business ties and travel to Cuba". latimes.com. ^ "Polling Report on Cuba, AP/Ipsos Poll, Jan 30 – Feb 1, 2007". Pollingreport.com. Retrieved June 15, 2012. ^ "Most Americans Willing to Re-establish Ties with Cuba". Angus-reid.com. Retrieved December 6, 2013. ^ "FIU Cuba poll: support for embargo wanes among Miami Cuban-Americans - Naked Politics". Retrieved March 21, 2016.